Gauguin stayed in the village of Pont Aven in Brittany in 1886 and again in 1888, the date of this view. 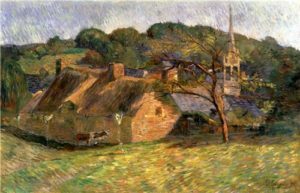 It shows a group of thatched farm buildings set in a fertile landscape, at odds with the reality of waning agricultural productivity in Brittany. Doubts have been raised about the painting’s authenticity due to a clumsiness in the composition and in the handling of the paint. However, there are some fine passages which are possibly beyond a copyist’s capabilities. 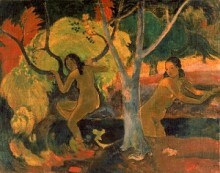 Perhaps the inferior elements simply show Gauguin merely going through the motions.